Something magical happens when Vanessa Grall walks into a room. Effortlessly posh with an upright gait and tragically keen eyes, Grall, who grew up in London’s Notting Hill, strikes you as classically put-together, like a mid-century actress, perhaps a fashion editor, or maybe a recent Oxford graduate. But the idealistic life that her appearance projects isn’t entirely indicative of her turbulent past. Luckily, the sound of that “nostalgic chord” spurred Grall to create Messy Nessy Chic, a perhaps awkwardly named but nonetheless wildly successful website that combines nostalgic stories, Parisian history, evocative photos, and surprising urban discoveries. Gifted with an aesthetic eye and an intuition for what connects with readers, Grall’s website has quickly grown in popularity, affording her what many would consider a fantasy life. Every weekend Grall goes out on walks with her boyfriend — an engineer who helped code the website — to discover Paris’ most unordinary stories. 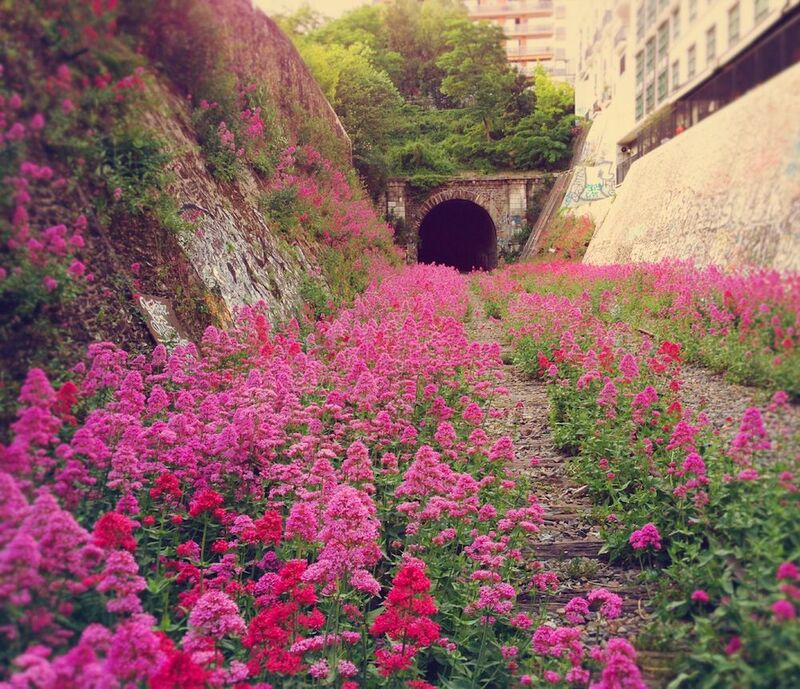 In one such instance she stumbled upon a railroad in Paris that’s been abandoned since 1934, a place that almost no one had seen, visited, or even knew about. The article she subsequently wrote, which was picked up by The Daily Mail and became immensely popular on both Reddit and Digg, is a perfect example of Grall’s surprising finds: gorgeous photographs (taken and edited on her iPhone), clever writing, and in-depth research. Grall is also particularly partial to Paris’ underrated flea markets, which house treasures for the patient and keen-eyed. (“The Marché Dauphine is my go-to for old prints and old photographs.”) Much of her time though is spent online, going through the Paris archives to find fascinating people, places and stories that have somehow gone untold. This unseen world — a world of flowers growing on old railroads, of secret restaurants, of Art Deco architecture that has been painted over, of forgotten histories — is the world that most interests Grall and, based on her site’s popularity, her readers as well. For such a hopeless nostalgic, Grall is surprisingly forgetful. When describing her past, it’s as though she’s peering through a foggy London day. (“I might have had a boyfriend,” she said of her sole year at university. “I may have even worked in retail.”) It’s not a surprise though that the 29-year-old can’t conjure specific memories of the past. In order to mentally inhabit a bygone era, one must, to a certain extent, forget about the present. The past comes alive mostly in the imagination, and Grall has found a niche where she’s able to help facilitate this kind of thinking. As writers tend to be prolific readers, so too nostalgics tend to be discerning aesthetes. The nostalgic prioritizes beauty perhaps above all else, and while some might view this as superficial, as a way to escape the reality of the present, many find that it is the only way to cope with a present reality that is never as perfect as it should be. Nostalgia and aestheticism have long been at the forefront of the cultural vocabulary, the root of so many emotions. When you see a train track that has long been abandoned, taken over by colorful flora, it’s impossible not to let your imagination roam. What would it have been like to ride that train? What were the passengers like? How was Paris different in those days? These are the thoughts, the emotions that these kinds of discoveries tap into. What so few people seem to realize is that it’s not the story itself that matters. It’s the feelings that a truly unique story can conjure and how much their words and photos can stir your imagination. As we got up to leave the café, Grall reached down to pick up her scooter helmet. I asked her what kind of scooter she had, and she let out a laugh. Previous PostWhat’s Really Behind America’s Suicide Epidemic?